Many Mac users may encounter the abovementioned format issue. Although AVI is widely used in our daily life, if you have AVI videos saved on your Mac computer, there does have a probability of the necessity to convert AVI to WMV Mac, either because the output WMV file enjoys great popularity for its small space occupation or you are going to send your partner emails with AVI files attached, but finding he is running on PC that its windows media player commonly recognizes WMV format instead of AVI file. In order to do this job without limitation, AVI video to WMV conversion becomes popular among Mac users. There are numerous pieces of software having video conversion ability in the market. But some programs have truly daunting price tag, while some, though free of charge, often comes with nettlesome watermarks and even gets stuck half a way. This drives you crazy, right? Luckily, if you stay on this page, you will surprisingly get a powerful yet easy freeware that simply helps for free with zero effort. To make AVI to WMV conversion done freely on Mac impeccably, MacX Video Converter Free couldn't be much easier to accomplish the goal. This utility provids an easy solution to help you transcode AVI to WMV on your Mac platform and offers quite a wide range of output video formats supports like WMV, AVI, MP4, HEVC, H264, AVCHD, MOV, MPEG, MP3 etc on Mac at 5X faster speed (GPU HA acceleration tech) with utmost quality reserved. Step 1. Add AVI Video. Free download the AVI video processing freeware on macOS, load the AVI file by hitting "Add File" button. Step 2: Choose Output Format..
To convert AVI to WMV on Mac OS X, you can select the target format "to WMV" button as your output video format. Besides, this Mac software also allows you to adjust the resolution, frame rate, bit rate etc. for perfect compatibility with your mobile devices. After finishing the above steps, click the "RUN" button to start to free transfer AVI to WMV format on Mac computer, you could view the conversion progress and are able to cancel the converting process at anytime. 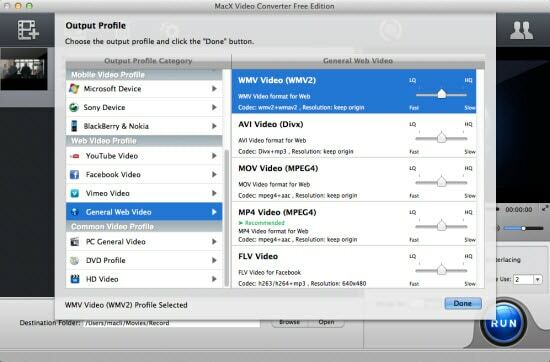 If this doesn't satisfy your demand and you want to get more video conversion on Mac, the advanced version program MacX Video Converter Pro can be a solid choice, which not only let you convert AVI to WMV on Mac OS X, but also features downloading YouTube video on Mac and convert video to MP4, AVI, FLV, MOV, MPEG, etc for later on-the-go enjoyment on iPhone 8/7/7 Plus, iPad Pro, iPad Air/mini, Samsung, HTC, etc. Stunning AVI to WMV Mac video converter to free decode and encode AVI to WMV for playback on meida player or mobile device 15X faster speed & no quality loss. Which One is the Best Video Converter? Top 10 Best Mac Video decoder for you to choose from.